You couldn’t imagine a castle in a more beautiful setting! Surrounded by 500 acres of parkland and a glossy lake, Leeds Castle used to be an idyllic haven for the royals – Henry VIII once lived here with Catherine of Aragon. During this private visit, your tour guide will show you how the Tudors lived at the spectacular fortress, and you can even sample a glass of mead at the recently refurbished Gatehouse! 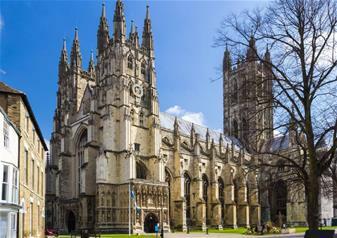 The medieval city of Canterbury is dominated by its breathtaking cathedral – it’s the oldest in England and considered to be the centre of English Christianity. You’ll visit the towering cathedral and be able to follow in the footsteps of pilgrims that flocked to the church following Thomas Becket’s gruesome murder in 1170. The gothic building hides many visual treasures, from the colourful stained glass windows to the creepy crypt. The striking gateway to England, the White Cliffs of Dover have stood loyally throughout invasions and two world wars! Get your cameras ready as we pause for a photo stop at this stunning stretch of coastline. Movie buffs will also enjoy seeing Dover Castle – a medieval fortress that portrayed the Tower of London in Hollywood film ‘The Other Boleyn Girl’! After Dover, you’ll head south of the River Thames to Greenwich! This World Heritage Site is full to the brim with fascinating maritime history – legendary tea clipper ship Cutty Sark is moored here. You will also see the fabulous Christopher Wren-designed Old Royal Naval College. End your day on a relaxing note and see some top London landmarks during this River Thames boat ride. You’ll float past iconic Tower Bridge and the soaring St Paul’s Cathedral along the route, before disembarking at Embankment Pier. This tour will finish at Embankment Pier in London at around 6.30pm. I enjoyed this trip. Although we had terrible weather... as the locals would say "you don't come to England for the weather- you arrive for the experience." Leeds Castles was small enough to walkthrough leisurely and the grounds were full of ducks swans who are very friendly and want your food. What I enjoyed most of all was the Greenwich river boat ride through the Thames River. I got amazing photos but also saw London from a different viewpoint. The only suggestion I would have is more time in Dover and none of that horrible Brown sauce on sandwiches... maybe pack it in a condiment packet instead as an option? 24 April, 2019 1 Adult 3pm Entrance Select Meeting Point Golden Tours Visitor Centre Victoria 01:00 PMBaker Street 01:10 PM I have read and accept the terms and conditions.